Hello, happy Tuesday! Thanks for popping by to read (and hopefully take part in!) 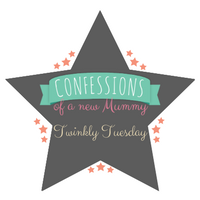 this week's Twinkly Tuesday post. First things first, I think I have finally managed to properly fix the badges. I know, its a miracle! For some reason I've been having an absolute nightmare in getting them to work. Finger's crossed this is now sorted, please do leave a comment to let me know if they're working for you. On to this week's Tuesday Twinkler. Sam wrote a post all about procrastination and how she has managed to find her motivation and get on with things. I don't know about you, but I am terrible for procrastinating, especially when its a job I really don't want to do so I shall be trying some of the tips shared. Are there any tips you would share? Do pop over and take a look at the post on Mummy Here and There. Featured blogger? Here's a badge, just for you! Just wanted to thank you for hosting, as I'd already read and commented on the very powerful post you linked this week. It's a good one - albeit sad. sorry to be a pain, but your badge is still not working for me. It's just leaving a html code with a yellow highlight over it. Oh how strange, its working my end?! Gah, how frustrating. Would you mind downloading the image and linking that way if it won't work for you? Shucks, still can't get the badge to work. But maybe it's me . . .? Gah, how frustrating Michelle. Would you mind downloading the image and linking that way if it won't work for you?